Last night marked Black Balloon Publishing’s first ever book swap party, an event so successful that people will be talking about it for decades and decades to come. 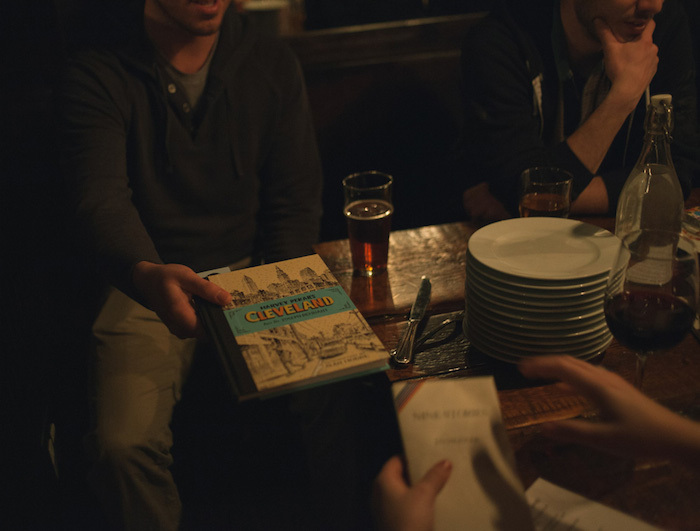 All jokes aside, we had a great time piling into the party room of Crown Heights’ Barboncino restaurant, drinking fine drinks and swapping great books. 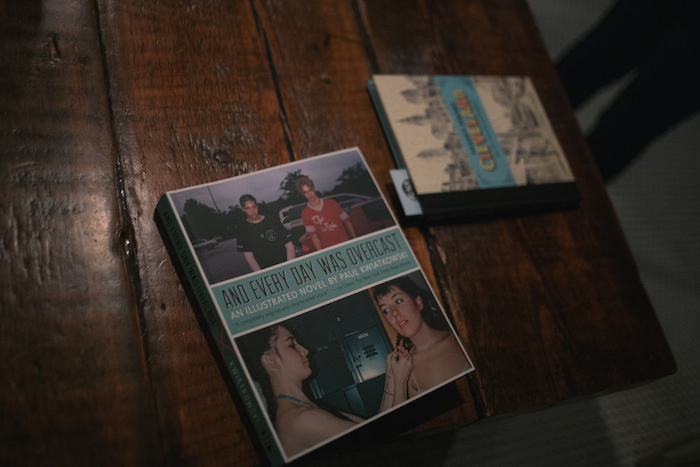 Below are some of the highlights from the evening, as well as some tips we picked up along the way, just in case you feel like throwing your own book swap party. Organized chaos is different than just, well, chaos. We already knew the general rules of our book swap, but we also had to iron out all the smaller details, like how many people would be in each round or how long each round was. We did rounds of six, keeping track of who was “on deck” and who was “on deck for being on deck,” which is absolutely the official term. Two minutes seems to be the magic number for how long two people need to pitch one book each, but as the official time-keepers, we tried not to be too much of a stickler about that. If it was clear that people were still talking through their plot, we’d let time run for a little while longer. Also, you might think the best tool to let people know that time is up would be a blow horn, but it’s actually a maraca. Who knew? Don’t bring a book that everyone has probably read. The only person who wasn’t able to make a swap (womp womp) was someone who brought One Hundred Years of Solitude. Listen: One Hundred Years of Solitude is an incredible book. That’s exactly why just about every high school and college across America teaches it. Instead, go for a not-so-well-known book by a well-known author. Though a graphic novel of a book that everyone has probably read is a great idea. Airship editor Arvind Dilawar traded in his copy of And Everyday Was Overcast by Paul Kwiatkowski for a graphic novel edition of Fahrenheit 451 by Ray Bradbury and Tim Hamilton. If books could have babies, these two illustrated novels would produce something that would leave the world scorched of sanity. Just because you don’t want to swap doesn’t mean you can’t get something out of the conversation. So it’s not even 30 seconds into the two-minute long round, and it’s already clear to both parties that a swap shall not be made. What do you do? Sit there in silence? Ask them their sign? No! Don’t fear the threeway swap. Perhaps the most epic moment of the night was when a threeway swap took place. Yes, you heard right: a threeway swap. Yeah, we thought they were an urban legend, too. It all began when Barbara set her eyes on a copy of Piper Kerman’s Orange is the New Black, but couldn’t convince the owner that her copy of Pnin was a worthy trade. The Orange is the New Black owner moved on and fell in love with a copy of one of Philip Kerr’s Bernie Gunther novels, but the owner wasn’t willing to trade for a memoir about women in prison. He was, however, willing to trade for a copy of Pnin. And, thus, the threeway swap was had. In Barbara’s own words: “In retrospect, definitely a weird swap.” But that’s the beauty of book swap: You can’t tie it down! The bigger the risk, the bigger the reward. The weirder the swap, the better. Once the books are swapped, you don’t have to go home and you can absolutely stay here. How often is it that you hear people — actual real, breathing people — discuss literature? And not, “Oh, yeah, I adored Infinite Jest” and “Oh, I, too, adored Infinite Jest” pretentious non-conversation, but an actual intelligent and fun discourse about literature? It’s rare, right? One of the best parts of book swap was watching people discuss their favorite books and shell out suggestions to one another. It’s not every day that you’re hanging out with a bunch of strangers who all love literature. At one point, we saw someone whip out their phone and say, “Hold on, I’m going to grab your number so we can talk books later.” We then proceeded to run to the bathroom and weep tears of joy. Weren’t able to make it last night? Yikes. Well, we hope whatever deadly disease you had cleared itself up, because that is the only possible excuse we can think of for not coming. Lucky for you, our book swap was so much fun that we will be definitely be holding more. Black Balloon Publishing is an independent press headquartered in New York, NY, with both print and digital distribution channels. We've published literary fiction, nonfiction and memoir, and we're willing to grow our reach in any direction that suits: Our books evolve, rotate, get mapped onto cities and light up your screen. We champion the weird, the unwieldy and the unclassifiable. Celebrating Shelley on what would’ve been her 217th birthday. Living abroad in China is like living in Shakespeare’s tragedy. A stranger reading Trimalchio on the subway seemingly opens up the doors to F. Scott Fitzgerald’s New York.